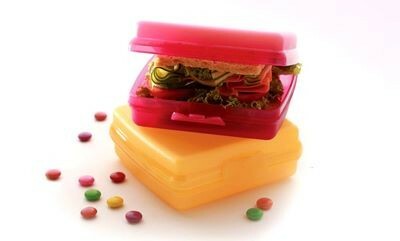 Sandwich Keepers Square are ideal for school and work lunches. Sandwich Keepers are environmentally friendly; there are no bags or wraps to be thrown out, which will help the environment and also save you money. Easy to use, the effective latching system on the Sandwich Keeper is simple enough for a child to open and close easily. The container is sized to fit traditional bread and sandwiches, yet is high enough to cater for hearty sized sandwiches. You can also use them to pack slices, biscuits or dried fruits. Keepers are not just for lunches; use them when travelling for storing jewellery, playing cards, soap and other personal items. One piece container means no seal to keep track of, or to get lost. Fits comfortably into backpacks, briefcases and some purses.